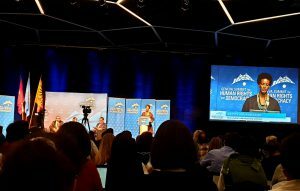 The Geneva Summit for Human Rights and Democracy took place on the 26 of March, and each year assembles hundreds of courageous dissidents and human rights victims, activists, diplomats, journalists and student leaders to shine a spotlight on urgent human rights situations that require global attention (Geneva Summit for Human Rights and Democracy, 2019). Why is Humanium attending this summit? Well, we help to create a world more just, peaceful and joyful for our kids… only when the adults of today have found their inner peace and are treated just, only then they will be able to pass on a sufficient good feeling for life to our kids so that they themselves stand up courageously for themselves and for others. 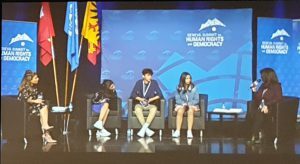 The Geneva Summit brings human rights activists together and educates the next generation… it gives a voice to the voiceless. The summit was welcomed by Hillel Neuer, Executive Director of United Nations Watch; it was discussed the topic of the authoritarian regimes on the rise, and the importance of the leaders of democratic countries to work closely, to work together. The question raised was if Human Rights are universal, and the answer was that universality is still a dream and a beautiful ideal for us. Later on, Prof. Irwin Cotler, Chair of the Raoul Wallenberg Centre for Human Rights, former Canadian Minister of Justice and Attorney General, advocate for political prisoners, legal scholar, during his conference on ‘Political Prisoners as a Looking Glass into the Resurgent Authoritarianism’ spoke about 100 environmental activists in Iran who were put into prison, and also stressed the topic of Venezuela, and the crimes against humanity in 2018 where 60% of infantil mortality rose in 1 year. 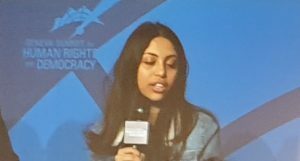 The summit carried on with the interview entitled ‘Why our Father is in Prison: a Conversation with the Family of Raif Badawi’. Mr. Badawi, is a Saudi writer, dissident and activist, and was arrested in 2012 on a charge of “insulting Islam through electronic channels” and brought to court on several charges, including apostasy. His wife Ensaf Haidar, Human rights activist, and their children Najwa, Tirad and Miriyam Badawi stated that “sharing our story gives hope…we are not alone, despite of the fact that our father has been 6 years in prison and another 4 years to count”. Moderated by Michael Levitt, Canadian MP, Chair of Parliamentary Foreign Affairs Committee, it took place the conference ‘Confronting Oppression, Defending Human Rights’ having the participation of Ketty Nivyabandi, Poet and exiled Burundian democracy activist, who led a movement of women-only protest; Nurcan Baysal, Award-winning Kurdish journalist and activist, who recently detained by Turkey; and Abdalaziz Alhamza, Co-founder and spokesperson for Raqqa is Being Slaughtered Silently, a citizen journalist group reporting Syrian war news and human rights abuses by the Islamic state. Ms. Ketty Nivyabandi declared “I am here to call you for action…democracy fell into pieces in Burundi in 2006”. 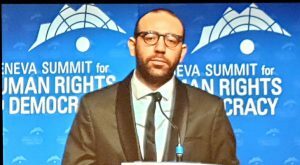 Mr. Alhamza, who was tortured for speaking out, said “none of us is free until all of us are free; there is no freedom of expression in Syria” he added that the “UN must do much more; we did many many campaigns, magazines, graffitti, reach bloggers against ISIS which is an ideology. It is so important to send messages out, please spread your word, each one of you is an activist”. 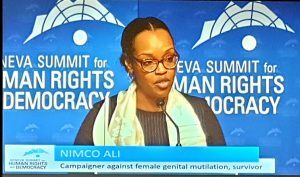 Finally, the presentation of the conference ‘Presentation of 2019 International Women’s Rights Award’, by Nimco Ali, Co-Founder of Daughters of Eve, advocate for women and girls at risk for female genital mutilation, survivor, was a very touching talk; Ms. Ali obtained the women’s rights award, she is a FGM survivor: 1 of 200 million, 70 million are still in danger in Africa nowadays.